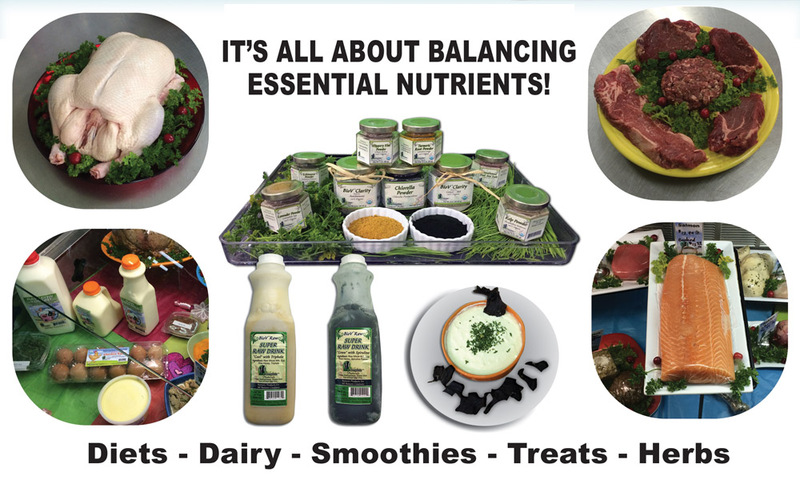 This Is How We Create A Balanced Real Food Diet! We prepare meals for ourselves, our families, and our children on a daily basis but when it comes to our pets we question everything from quantity to ingredients. How can we be so aware for ourselves but remain clueless when it comes to our pets? For the past 40 years, we have been indoctrinated, through the pet food and veterinary industries to believe that our pets’ nutritional needs are so unique and complicated that only a commercially manufactured pet food is complete and healthy. Interestingly enough, dogs and cats have been domestic pets for thousands of years and commercial pet foods are only recent creations. These recent creations have provided us with convenient, modern kibble being introduced in 1955. How did they survive before this? We balance our diet by eating a variety of foods, based on our omnivore physiology. This includes a variety of foods from each of the biologically appropriate food groups. The ideal for humans would include fruits, vegetables, meats, fish, eggs, nuts, and berries. These can all be eaten in their raw, natural form. You will notice two variations from our USDA recommended diets. There are no grains as all grain products MUST be processed for our bodies to accept them. And yes humans can eat and easily digest raw meat and fish as they do in many cultures worldwide, although with the dangers of factory farming we rarely practice that here today. Constant variety presents all the vitamins, minerals, proteins, fats, enzymes and other nutrients the body needs. You will be pleasantly surprised at the ease of obtaining these nutritional necessities naturally for your pet. Education is a key and we are here to help. Visit http://biocompletenaturaldiet.com/ to learn more. Let’s look at your dogs and cats. They are carnivores based on their anatomy and physiology. Their teeth are designed for tearing meat and crushing bones. Their digestive system is specialized to best utilize the nutrients that are in these foods. We can confirm these diets by looking at their wild relatives. Lions, tigers, wolves, and panthers hunt animals, not corn plants. To make it easy for the pet owner preparing a meal plan for their dogs and cats, we recommend breaking their food groups into how they eat in nature. Poultry and small animals are usually eaten whole, bones and all. Prepared real foods usually contain ground bone and high quality meat. Larger red meats are usually muscle meat with liver and other organs included. These meats prepared as real food for your pets can be whole or ground. Their final food group is fish and other seafood which again in nature is consumed whole. There are natural resources available all around us but we must be sure that they are really “all natural” along with being chemical and hormone free. All of the previously foods mentioned above are generally consumed with water from ponds and puddles that contain algae and extracts from the herbs within them. We can domestically achieve the same balance with herbs such as Chlorella, Spirulina, Black Walnut and Echinacea to name a few. These components aid in detoxification of the body as well as provide additional nutritional necessities for the body. All these foods bring natural vitamins, minerals, enzymes, amino and essential fatty acids to your pet’s body just as the bone will provide your pet with the natural calcium in the proper digestible form for strong bones. The red muscle meat builds strong muscles including the heart. Fish provides Omega 3 fatty acids that help the body heal and fight off health challenges. Along with fish, supplements such as Wild Salmon Oil and Krill Oil will provide a convenient source of Omega 3’s as well. Keep it simple and easy… every day feed a different food, rotating through the groups. You’ll be able to tell what your pet needs by the way they react to various foods and you’ll observe that their favorites will change on a regular basis as their conditions and challenges change. Quantity varies as it does with us. Using different combinations and blends will keep it interesting and your pet will be healthier and happier. You can find everything you need along with nutritional guidance at the greatest source of all natural pet foods and pet products. ← Why Would Anyone do That? Do I need all these Treatments?